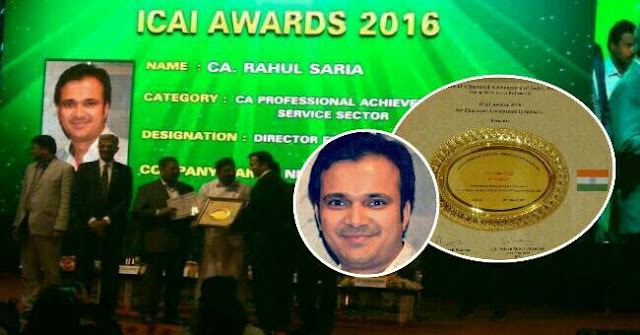 CA Rahul Saria has once again made our City ‘Siliguri’ proud, by his achievement. He has been bestowed with “CA Professional Achiever” 2016 award by the Institute of Chartered Accountants of India (ICAI) for his outstanding performance and exemplary contribution towards the growth of Industry, economy, and the country on all India Basis. Yesterday, on 20th January, he received the award from the Honble Education Minister of Tamil Nadu, Mr. K.Pandiarajan, ICAI President & Vice President; and Rajya Sabha MP - CA. K. Rahman Khan at the ICAI Awards 2016 function in Chennai. He was also awarded “RAJYA PURASKAR’” (Governor’s Award) By VIREN J. SHAH in 2003, the then Governor of West Bengal for excellence in Scouting & Service to Mankind. Presently he is in Bangalore and advising lot of start-up companies in setting up the finance function end to end. He is also a Director Finance of a multi-national company “Near” and District Finance Officer (Board Member) of District 92 of Toastmaster International, USA. Please join us in wishing him all the success and a great future ahead. We also wish that he continues his service towards mankind both professionally and personally. Information provided by Debu Saria, Rahul's father.